It’s been a rollercoaster few days: constructive discussion overshadowed by insensitivity and bias; and the discovery in a #MatExp discussion of misconceptions and a paradox that needs to be addressed. 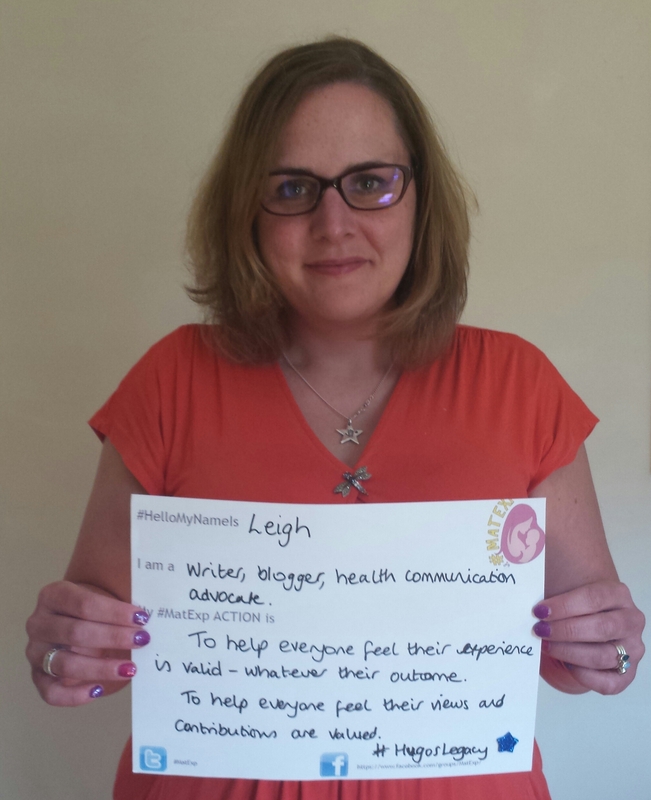 Anyone who knows even the smallest amount about me knows that I am passionate about Hugo’s Legacy, which in a nutshell includes improving communication for neonatal parents, women who have suffered birth trauma, and improving information and support for bereaved parents. Each of these three issues: neonatal care, birth trauma, and bereavement do not receive the focus they deserve. The people who have experienced these issues do not receive the support they need and deserve. That’s why I am so vocal about it. Why am I vocal? Because I feel I – and women like me – are not being heard. For example, say there’s a discussion about choice of where a woman gives birth. Some will say women always have a choice. Some will say it depends if you are ‘low risk’ or ‘high risk’ as though that is clear cut and black and white (it is far from it). Some, like me, will argue we had no choice. Or no choice that was meaningful, anyway. Too often, I feel that evidence is quoted at me about outcomes, NICE guidelines and other such things. What I try to say is that I understand the evidence. But human beings do not obediently adhere to evidence. We are all individual and have our individual needs. Sometimes, our bodies do things that are beyond our control. My body did things way beyond my control when I was pregnant with Hugo. These things nearly killed me. Understandably, I feel rather traumatised by the events. Understandably, I like to feel like I am being listened to, my experiences respected, my feelings valid when I talk about them. In short, too often I feel drowned out by doctrine. That is an unfortunate word, but it’s a bit like when you see politicians being interviewed on the news: they often ignore what the reporter is asking them, quoting instead their own key messages. Without wanting to sound flippant, it sometimes feels like those who quote the evidence at me are putting their fingers in their ears and singing ‘la la la’. In return, I roll my eyes and mutter ‘blah blah blah’. It creates animosity and mistrust between ‘sides’. There should not be any ‘sides’ – ultimately we all want the same thing, which is safe, individualised care for women, no matter where they give birth and no matter by which method the baby is born. …but I do think it is a difficulty in having bereaved families leading discussions around maternity care – I for one sometimes don’t know when to take the personal approach and when to approach it as I would when discussing a question of evidence based care with another committee member without thinking of their personal background. There is conflict and I do not think there can NOT be conflict. And having had discussions around birth trauma with women who have NOT got to a place of peace, I do strongly feel that it is almost impossible for them to have a balanced discussion as it is too weighted an issue for them. The person who wrote this has apologised. But I was so upset about it I sobbed. I sobbed most of the day, and cried myself to sleep that night. I am sure the person feels bad about writing it, and I include the quote not to provoke further upset, but to underline the point that these views have to be addressed. It upset me because there an implication that as a bereaved mother I am incapable of being impartial. That I will always be biased. That having experienced the loss of my child and birth trauma has somehow scrambled my brain and my common sense. The fact is: nothing will bring back Hugo. Nothing will give me back my pregnancy. Nothing will give me back those months I lost last year in a fog of nightmares, terror, and flashbacks and feeling that I was bonkers simply because services had no idea what to do with me. I have talked before about how lonely grief can feel. I have talked before about how much of a taboo bereavement is. I have also mentioned the offence I took at how bereaved parents are actively excluded from the national Picker neonatal survey. I am sure the exclusion is with the best of intentions, thinking it is being sensitive. But I also wonder whether there is a concern that they will receive feedback that is too negative. Like the quote above implies, that our feedback will be biased, imbalanced. How do we get our voices heard with such misperceptions of the bereaved, and those who have experienced trauma? It is incredibly patronising. 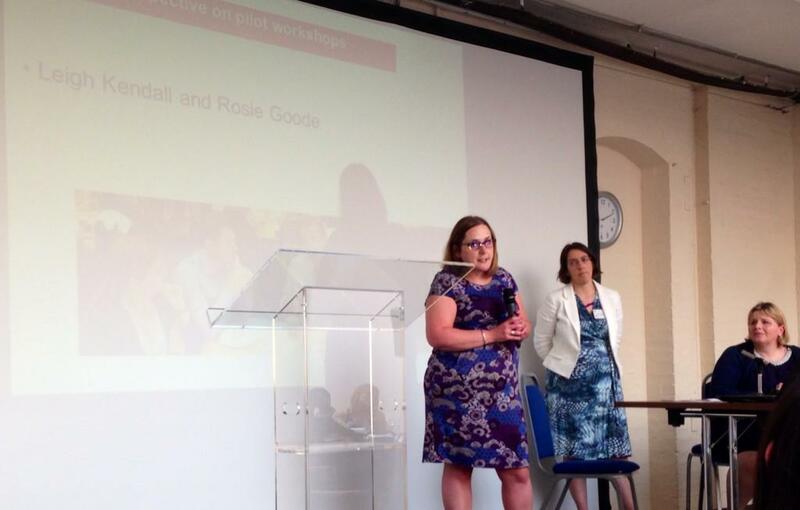 Talking about Hugo’s Legacy and MatExp at a maternity Strategic Clinical Network conference. Not listening to people only compounds the upset, and generates more anger, potentially making existing issues more difficult to resolve – and creating new ones. Reliving my experiences distresses me, as you can expect. But I am not a masochist. The reason I pour out my heart on this blog, the reason I have got up at stupid o’clock to get on a train to a hospital I’ve never visited before to bare my soul to a room full of strangers is because I want to make a difference to other families’ experience. To make a positive from a tragedy. Whenever I talk or write about my experiences, I am clear about how everything clinical was gold-standard. What let it down was communication – it underpins everything. So simple yet so easy to get wrong. What on earth do views like this mean for wider patient engagement? Do we exclude from engagement or discussions about any service people who are traumatised by their care, or diagnosis? Do we exclude people with long-term conditions? Their views on the issue will surely be weighted by their experiences. Like the bereaved and those who have experienced any kind of trauma, it is something they live with every single day. Anyone who thinks they are truly impartial they are deluded. We are all shaped by our experiences; those experiences make us who we are. We cannot pick and choose. In the context of patient experience, staff listening to the patients will also be shaped by their experience. To suggest that discussions can only take place with those without ‘issues’ means that discussions can never take place. We do not fit in to neat little boxes with neat little labels. Evidence-based care is vital, of course, but not everything can be quantified with neat little numbers and put in a pretty chart. Patient experience is about qualitative evidence – giving people a voice, and listening to what they have to say, even if it is unpleasant or uncomfortable. I’ve been told I am a ‘conversation stopper’. I’ve also been told it’s not just about me. It’s a minefield of emotion. It has to be put in perspective – your discomfort will last for a short while, but the heartbreak of a bereaved parent will last for a lifetime. That doesn’t mean the feelings of the non-bereaved don’t matter – of course not. Anecdotally, I have heard and read of women who experienced birth trauma who feel that their story is not valid because they took their baby home. Taking home a baby is not the only thing that matters. The way people’s experiences affect them depends on so many factors it is impossible to quantify. There is no better or worse, there is no scoring or ranking system. But on the other hand, there are few people who can imagine something worse than the death of their own child. This is the nature of the paradox. There may be people who are unable to understand the paradox, and while that is frustrating I am also glad because they do not understand the pain of grief. If there are people thinking the voice of the bereaved is loud, we need to take a step back and reflect on why we have to shout so loudly. Keep harping on about the same things. We need to make sure all views are heard. That everyone feels their views are valid, their contributions valued. That there is no hierarchy. Because until we can be more comfortable with – or least accept – discomfort, there is likely to be more unnecessary hurt and upset. Surely no one wants that. It’s so true that all views and voices are necessary. Even among the bereaved, our experiences are so incredibly diverse that to lump all babyloss moms together would be crazy. Plus, women with birth trauma may have living children, while those who lost their babies may have had a very peaceful birth experience. Keep fighting the good fight, Leigh! I was pretty horrified at some of what was said on that thread. Surely we need to hear all voices? Even (perhaps especially) those that we don’t agree with or find difficult, if we’re actually going to make changes that benefit everyone? I doubt that anyone in that group has an entirely rational and non emotional opinion on the subject, weather they are a mother or a professional. It’s just not a subject you can come to with experience but no baggage. All the more reason for us all to challenge our own beliefs by listen to the views of others with different experiences to us. As you know I’m also a big fan of “evidence” and evidence based medicine/ care but it’s so often poorly understood or just abused. People cherry pick one paper that agrees with their own beliefs and ignore the weight of evidence against or try to apply statistics that are only meaningful at the population level to an individual. The media also loves to jump on anything that seems to be telling women what to do and ignores that it often applies to only some of us. Thank you, those hugs are much-needed! I think many of us were horrified – I am no longer part of the group because of it. It is a shame, but there are many other ways (and more constructive/productive ones) to make sure my voice is heard. You’re right about cherry picked evidence. Lies, damned lies, and statistics springs to mind! You have a special expertise that someone “impartial” will never have. You know firsthand what was helpful and what could have been done differently. Keep speaking your mind, you have much to share to improve healthcare and keep Hugo’s legacy alive.